Before you begin, get the best tools for keeping tabs on your event’s progress. As we all know, maintaining track of every tiny detail is hard work. Luckily, there are a lot of great ways to ensure nothing gets forgotten about. Try Trello – a great free online platform that allows you to organise and monitor your projects collaboratively using lists, boards and cards. It also has a great app so you can organise your event on the go, no matter where you are! Now that you’ve got the right tools, let’s get started! 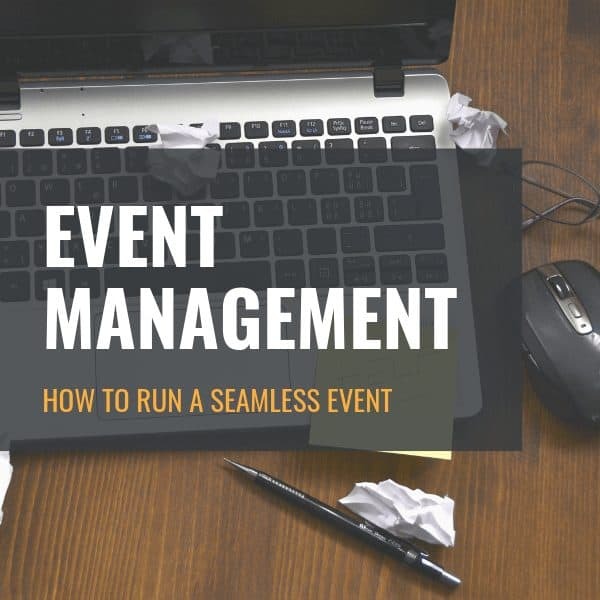 The vast majority of event management happens before the event. Here is a checklist of things to get done in advance. Set the event goals and objectives. This will help ensure that you always keep your eye on the prize and that your final event is a true expression of what you set out to achieve. Also, do an online audit to ensure your proposed date isn’t clashing with competing events. Make sure you check it out in person and perform a proper site visit. Select the right suppliers, rentals, speakers and entertainers and book them for the date. This may mean paying some deposits so have the necessary funds available. If it’s an open event, promote the pants off it. Set up all online necessities. Such as ticket sales, registration forms, event information and contact details. Ensure that these are in place, as well as medics/emergency services as well as public liability to ensure everyone is safe and you are covered. This will include a contact sheet for the event (including emergency numbers), floor and seating plans and a detailed running order. If you have stuck to the pre-event checklist like a boss, the actual event should be a breeze. Of course, there is always the potential for unforeseeable problems, so make sure you take this part of the checklist seriously too. Send out a final reminder early in the morning. Arrive at the event far ahead of the start time. This way, you can make absolutely sure everything is in order and if it isn’t, you have time to solve any problems. Regularly check in on your running order and times. If you lose time somewhere along the line, you will finish late. Take lots of pictures and short videos. These will be super useful for post-event promotion. The event doesn’t end when attendees leave and there is a lot be done and gained in the proceeding days. Supervise the deconstruction of the event space. This way you can ensure nothing is unnecessarily damaged and everyone is doing their designated job. Follow up with suppliers and make outstanding payments. Make sure this is done timeously to maintain positive relations for future events. This can be a simple thank you mail with links to future events. You can even ask them to fill out a survey which will help you improve on future events. Post pictures and videos to your social platforms. Get the most out of your events by properly capturing data every step of the way. If you’re looking for a professional event management company in South Africa, contact us today.